This page gives the detailed breakdown of the analyses discussed in this post on Mark’s blog. All analyses have been conducted in R. An R package for reading and analyzing DataVolley scouting files is in development: see https://github.com/raymondben/datavolley. The data are almost the entire set of matches (missing just one match) from the 2015/16 Italian League. A brief summary is given below. 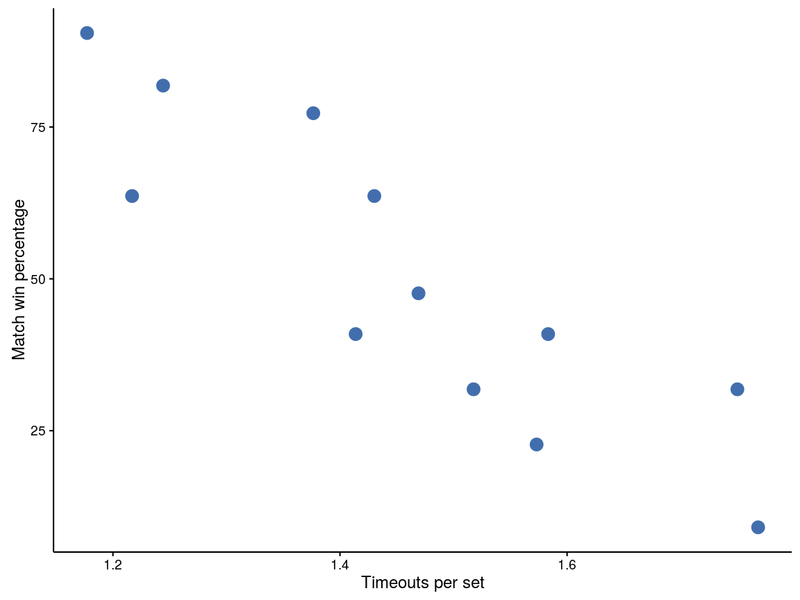 The motivation for this analysis is to examine the effects of timeouts in volleyball matches, particularly with respect to serve errors and sideouts. We start with a general overview of timeout calling patterns. How often do different teams call timeouts? When are timeouts called? 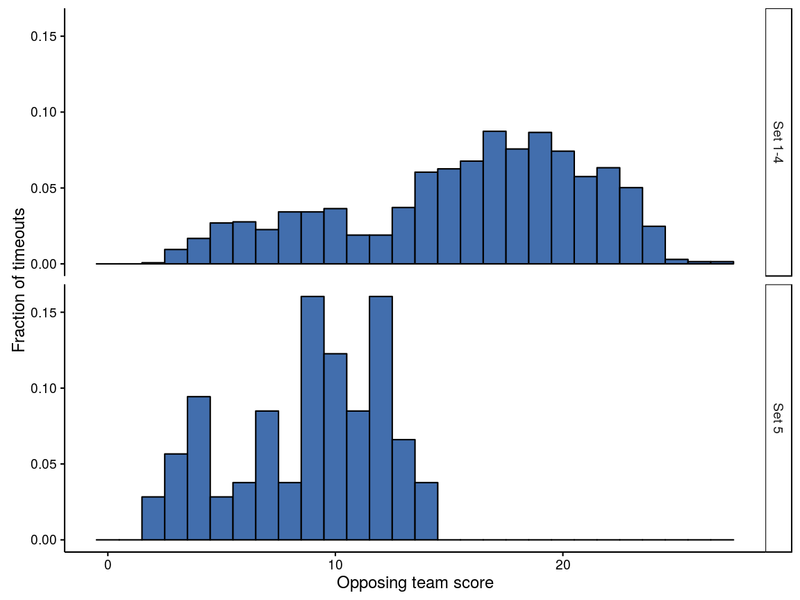 Below is a histogram of the opposing team’s score (at the time that each timeout was called). Sets 1–4 are plotted separately from set 5, for obvious reasons. For sets 1–4, there are technical timeouts at 12 points, which correspond to the dip in the upper panel. Coaches will typically avoid using a team timeout when a technical timeout is imminent. This dip aside, there is a general increase in the number of timeouts called as the set progresses, peaking just below 20 points. Set 5 (during which there are no technical timeouts) shows a peak around 3–4 points, a second around 10 points, and possibly a third around 13 points. There is a hotspot when the opposing team’s score is around 5 and the calling team’s score is lower — so the opposition has jumped out to a quick start. It is clear that most timeouts generally lie above the 1:1 dashed line, meaning that the opposing team is ahead of the calling team. There are also a number of timeouts called when the calling team is ahead of the opposition, mostly towards the end of the set: possibly these might correspond to situations where the opposing team has scored a run of points and is catching up to the calling team, but this wasn’t looked at further here. Only a small proportion (about 24%) of timeouts were called by a team that was leading at the time. None of the above is particularly surprising, but it serves to confirm that timeouts are generally called by the receiving team, at times when some sort of intervention might be expected to be helpful to the outcome. perfect pass rate (the proportion of receptions rated as a “perfect pass”). first ball serve loss rate (proportion of serves where the first attack by the receiving team was successful). Statistical tests have been conducted to evaluate whether a given indicator varies across the different situations. What does a significant result mean in this context? We are assuming that our dataset is a sample that is representative of some larger volleyball universe. The significance (p-value) of a test performed on our data indicates the degree to which we expect the result in question to hold true in the larger universe. The statistical models used here are generally binomial mixed-effects models, in which the response is the indicator in question, and a random effect by individual player is included. A “binomial” model simply means that the response can take one of two values (e.g. if we are examining serve errors, then a given serve was either an error or it was not). The random effect allows individual players to vary in their performance. Including this random term will also account for the fact that some players might perform the skill in question more often than others across the various serve categories. In general, we test by fitting two models for each indicator. The first model has a single fixed predictor term (the serve category). The second has no predictor terms — that is, it assumes that the indicator does not vary with serve category. We then compare the fits of the two models. 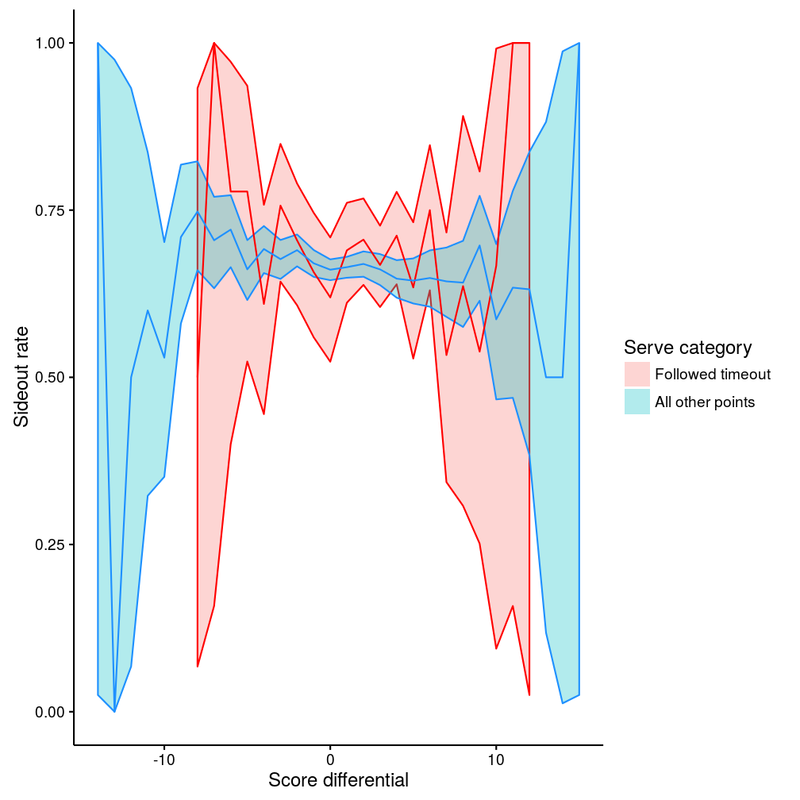 If the first model is a statistically better fit to the data (p<0.05), then it supports the idea that the indicator does indeed vary with serve category. Below is a tabulation of the number of individual players associated with each of the serve categories, and the average number of serves that each player made in that category. Notice that the “first serve of the set” category represents a much more limited number of players than the other categories. This is of course because the starting rotation of each team is relatively consistent from set to set. The number of players associated with serves after technical timeouts is next smallest, because technical timeouts occur at fixed scores (first team to 8 and 16 points) thus restricting the possible rotations that can occur at these times. For each indicator a brief summary of the data is shown, along with “raw” and model estimates of rates. The raw rate is calculated directly from the data (e.g. number of errors divided by number of serves), whereas the model estimate is the same rate but adjusted by the random effect in the model for the individual players involved. The proportion of serves where a service error was made. 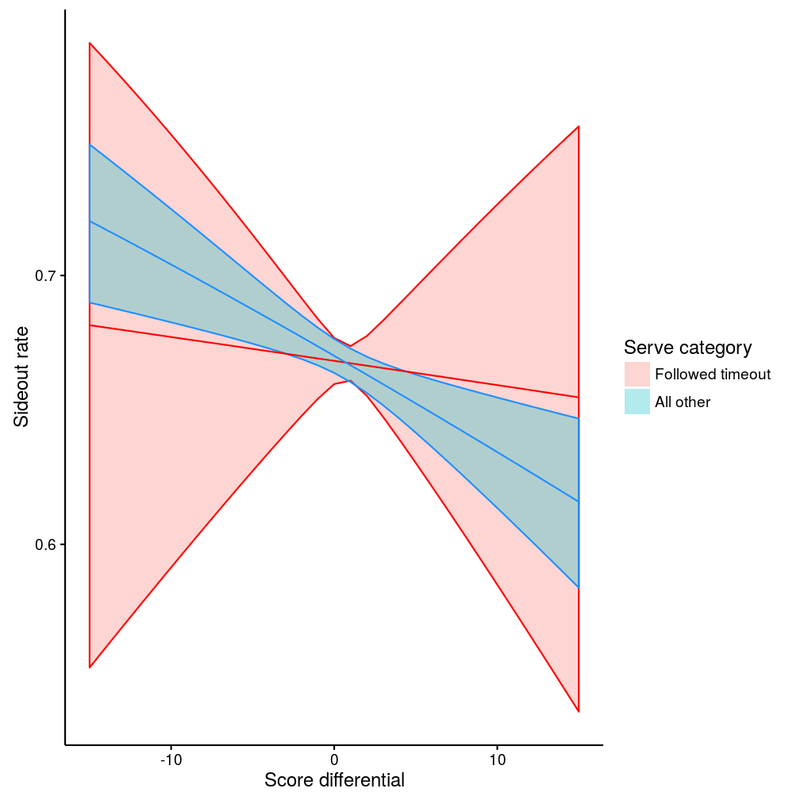 Is there an overall difference in the service error rate in the various serve categories? The proportion of serves that were aces. The proportion of receptions that were rated as a perfect pass. The model in this case has an additional random term for the serving player (that is, it tries to account for idiosyncrasies in both the serving player’s serving ability as well as the receiving player’s passing ability). 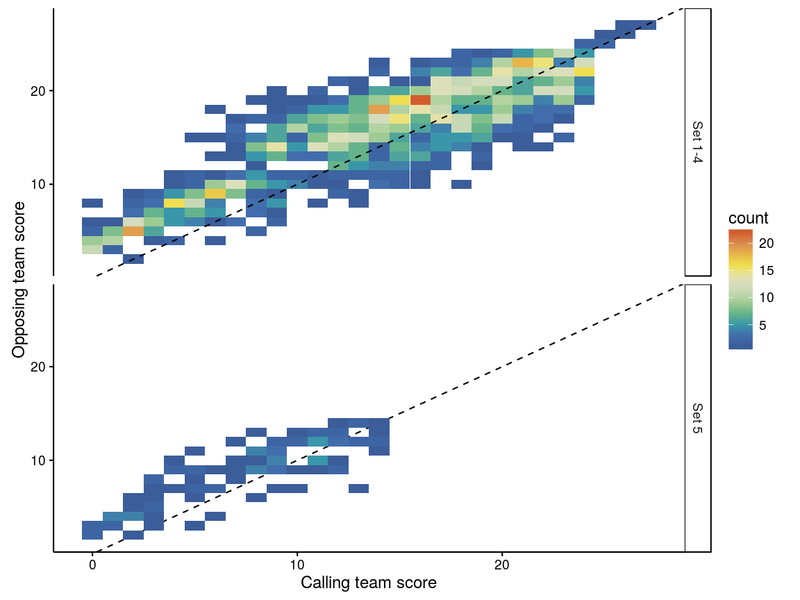 For sideout indicators, the result is modelled in the same way as before (binomial mixed model) but with a random effect on team rather than individual player (because the sideout rate most likely depends more heavily on the overall team, rather than just the player who is serving). Sideout and serve loss rates excluding service errors (i.e. where the receiving team “earned” the sideout). Proportion of receptions where the first attack by the receiving team was successful (service errors are excluded). In this case a simpler model is used, with no random effect by player, because players tend to be consistent in whether they jump serve or not (which causes problems in the numerical fitting of the model). In the previous section we found little evidence to support the idea that overall sideout rate differs after timeout than during general play. Are there more subtle effects — for example, does the effectiveness of a timeout change as a set progresses? Here we are focusing on sideout rate, and only comparing after-timeout serves to all other serves. What about score differential? Here, differential is defined relative to the serving team (so a positive score differential means that the serving team is ahead). We don’t distinguish which team called a timeout (though as previously shown it’s overwhelmingly the receiving team). For score differential between about -10 and +10, the two lines are again very similar. Overall, the confidence intervals of the two curves overlap, consistent with out earlier finding that there is no overall difference in sideout rate after timeout. Sideout rate is higher when the serving team is behind, and sideout rate is lower when the serving team is ahead (exactly as one would expect). 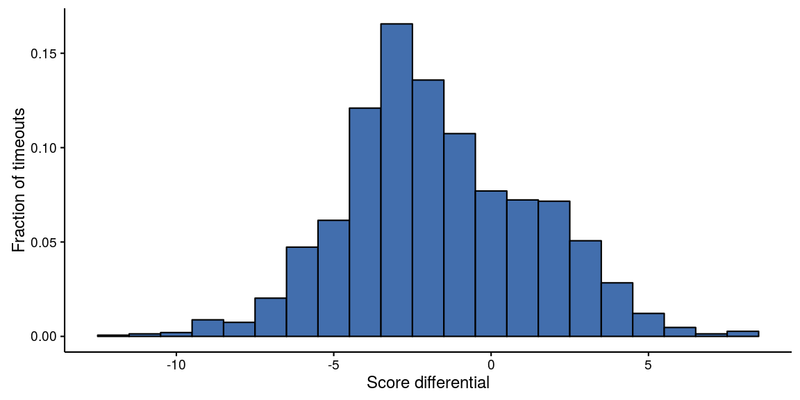 At more extreme score differentials (below -10 or above +10) the data are less consistent and the confidence intervals much wider, indicating that there isn’t sufficient data to draw strong conclusions. So the numbers we are extracting from the data are about right. The small differences are at least partly due to the ends of sets (say a set finishes with a run of three serves: we do not count this as a run of three because it didn’t end with a sideout — maybe it would have continued for several more serves had the end of the set not brought it to a premature halt). We fit a model of serve error as a function of run position, so that we can examine whether serve error varies depending on where the serve is in its run. 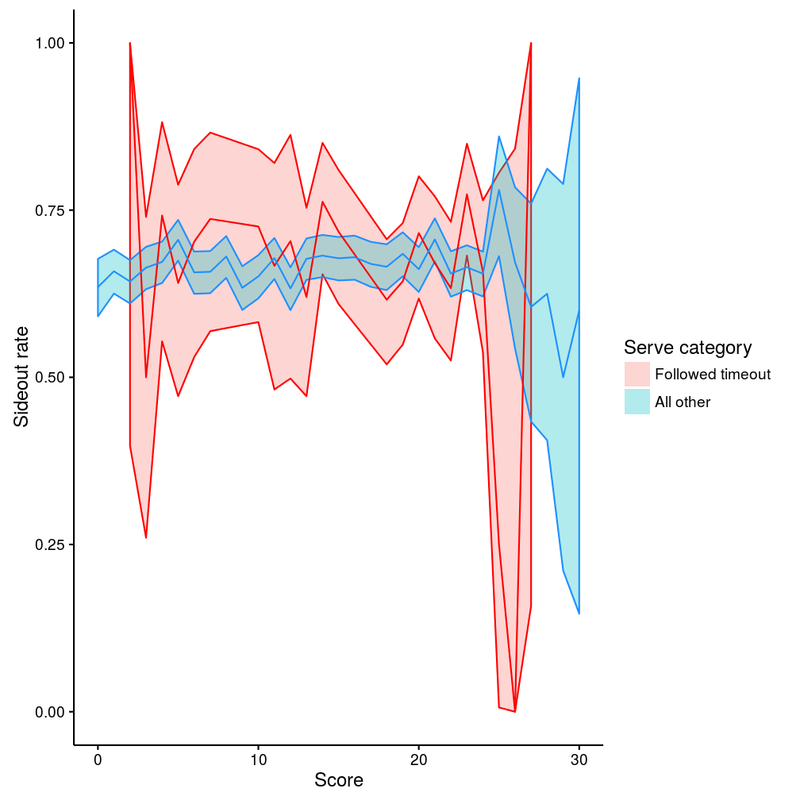 The model estimates for serve error rate should roughly match the values in the “ALL TEAMS” data summaries above, but will not necessarily match exactly because the model includes a random effect for the individual server (to try and account for variations due to individual servers). What about timeouts? Does calling a timeout during a run of serves affect the serve error or sideout rate? First of all, we fit the same models as above, but with an additional term for whether or not the serve followed a timeout. That is, the serve error/sideout rate is estimately separately for each run position, along with an additional adjustment for timeout. The timeout adjustment applies equally to all serve run positions. Note that the error rate estimates here (for run position 1–5) are slightly different than in the previous model — because now we are additionally accounting for the effect of timeouts. When during serve runs are timeouts called? After how many breakpoints (points won on serve)? Are multiple timeouts ever called during a single serve run? Rarely. There were 1436 serve runs in which at least one timeout was called. Two timeouts were called in only 42 of these. Posted on Saturday July, 16 2016 at 09:40:00 .